The diversity of options is one of the most appealing aspects of burger night. Grilled chicken, pork, lamb, vegetarian, or beef. All are equally delicious. Adding to the wealth of choices, more and more hungry connoisseurs are changing up toppings as regularly as they change protein. Here are a few that could easily prove to be your next favorites! First up, an intriguing blend of ground pork, goat cheese, grilled peaches, and arugula from Country Living. Pure summer decadence! Next up. From Half-baked harvest, we find a recipe that combines all of the goodness of whiskey and Guinness with some of the best onions ever. Add blue cheese to the mix and we were sold! Now, this recipe is not for the faint of heart. Not only is it NOT quick, it is also a complex flavor profile that may not be for everyone. But give it a try and we think you’ll agree it might be hard to top. 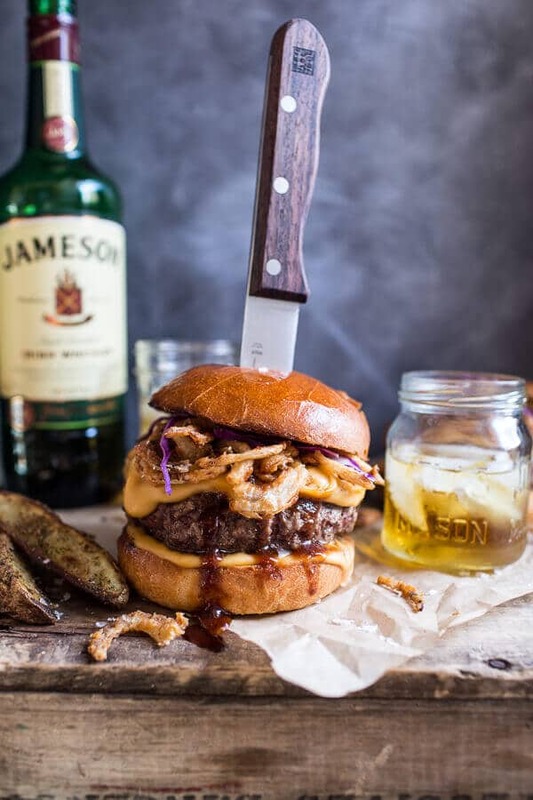 Jameson Whiskey blue-cheese burger with Guinness cheese sauce and crispy onions. To make the crispy onions, add the sliced onions to a large bowl and pour the buttermilk over top. Use your hand to submerge the onions in the buttermilk. Allow the onions to sit in the buttermilk 10-30 mins. Meanwhile add the flour, salt and a pinch of both cayenne and pepper to a bowl and give it a good toss. When ready to fry the onions heat a large pot of oil until it reaches 375 degrees F. or until a pinch of flour sizzles when sprinkled over the pot. Remove a handful of onions from the buttermilk and place them into the flour mixture. Coat the onions in the flour mixture, and then tap them on the inside of the bowl to shake off the excess. Carefully drop the onions into the hot oil. With a spoon, fiddle with them a bit just to break them up. Watch the onions closely as they cook quick! After about 1 or 2 minutes, they should be golden brown, remove from the oil and place on a paper towel-lined plate. Repeat with the remaining onion slices. Onions are best served right away but can be reheated in a 300-degree oven for 5 minutes, watching them closely and making sure they do not burn. To make the whiskey glaze, add the whiskey, ketchup, soy sauce, honey, mustard, Worcestershire, cayenne and pepper in a small saucepan. Bring to a boil and then reduce the heat to a simmer. Simmer 5 minutes or until the sauce has thickened slightly. Keep warm over low heat until ready to serve (or store in the fridge and warm before serving). To make the burgers, divide the meat into 4 sections. Place a cube of blue cheese in the center of each and then inclose the cheese in the meat forming 4 patties. Place the patties on a plate. Preheat the grill or a grill pan to medium-high heat, once hot, season the burgers with salt and pepper and then grill until your desired doneness. About 4-5 minutes per side for medium-rare. Remove the burgers from the grill and cover with foil to allow the burgers to rest while you prepare the cheese sauce. To make the cheese sauce, heat a medium saucepan over medium heat. Add the butter, and once it’s melted and bubbly add the flour. Whisk together to create a roux and cook for 1-2 minutes until mixture gets a bit golden in color. Add the beer and 1/2 cup milk, stir and turn down heat to low. Continue stirring until milk thickens. Add the cheddar cheese and continue to stir until mixture is smooth. If the sauce seems too thick, thin with more milk. Season with salt and pepper. To serve, place each burger on a toasted bun. Top with a good amount of whiskey glaze and cheese sauce. Add those crispy onions and then the top bun…give it a good squash and DEVOUR! Vegetarian burgers have come a LONG way. No more are they simply hockey puck like mostly tasteless dry patties. Here is one of our favorites from Saveur. Even non-vegetarians will love the delicious flavor combination. 1. Make the burgers: Heat 3 tbsp. oil in a 12″ skillet over medium-high heat. Add onions, and cook, stirring, until soft, about 4 minutes. Add the garlic and poblanos, and cook, stirring, until soft and slightly caramelized, about 5 minutes. Add cumin, paprika, coriander, oregano, and chipotle chiles, and cook, stirring, until fragrant, about 1 minute more. Transfer to a bowl and let cool slightly. Add breadcrumbs, beans, and eggs, season with salt and pepper, and mix well to combine. Divide mixture into six 5 1⁄2-oz. patties, about 3″ wide x 1″ thick; place on a plate and refrigerate for 20 minutes or until ready to use. 2. Make the avocado crema: Combine sour cream, lime juice, avocado, and salt and pepper in a blender, and purée until smooth. Transfer to a bowl and cover with plastic wrap; store in the refrigerator until ready to use. 3.Heat 2 tbsp. oil in a skillet over medium-high heat. Dredge 3 burgers in cornmeal, and cook, flipping once until toasted on each side and cooked through, about 4 minutes. Repeat with remaining oil, burgers, and cornmeal. 4. Spread the bottom half of each bun with avocado crema, top with a burger and some Salsa Fresca and serve. Bring on the poultry! Chicken burgers have become increasingly popular as cooks find new and exciting ways to pep up one of the most popular protein options worldwide. The Food Network’s Rachael Ray really delivers southern flavors with this great choice. In a small skillet over medium heat, melt butter. Add chopped onions, garlic and tomato paste and sweat them for 5 minutes to soften and sweeten. Sprinkle with sugar and remove from heat. Cool in a bowl, 5 minutes. Add tomato paste mixture, Worcestershire, hot sauce to bowl and combine. Add chicken to the bowl then grill seasoning and combine the burgers well to evenly distribute the flavors and form 4 patties. Wash up. 2. Heat 1 tablespoon extra-virgin olive oil, a turn of the pan, in a nonstick skillet over medium-high heat. Cook patties 6 minutes on each side. 3. Combine the honey, lemon juice, and remaining extra-virgin olive oil in a bowl. Add relish, cabbage mix and sliced onions and season with salt and pepper. Toss the slaw to coat and reserve. 4. Serve burgers on bun bottoms topped with slaw and bun tops. And finally. For the ultimate traditional beef burger, we turn to Tyler Florence. Even using a limited number of simple ingredients he manages to perfect an American classic. Using ground brisket creates a burger that may very well change your life, however, even using basic ground chuck ensures a burger masterpiece. Sometimes simplicity is key. Here, part of the magic is in the toppings. Go wild with sauteed mushrooms, caramelized onions, a combination of cheeses along with the basic lettuce and tomato. In a large bowl, lightly season ground meat with salt and pepper if you like (optional) and mix in gently with your hands. To shape the burgers, take about 1/8 of meat and form it into a meatball; then flatten it a between your hands until it’s about 1/2 in. thick. Turn the patty on your palm while firming up its edges with the thumb and forefingers of your other hand (your goal is to get rid of a crumbly edge). Repeat with remaining meat. Let burgers rest at least 30 minutes in the refrigerator. There you have it. Just a few of our choices for burgers we absolutely HAVE to try this season. Try one, or all, of them for yourselves and let us know your favorites!